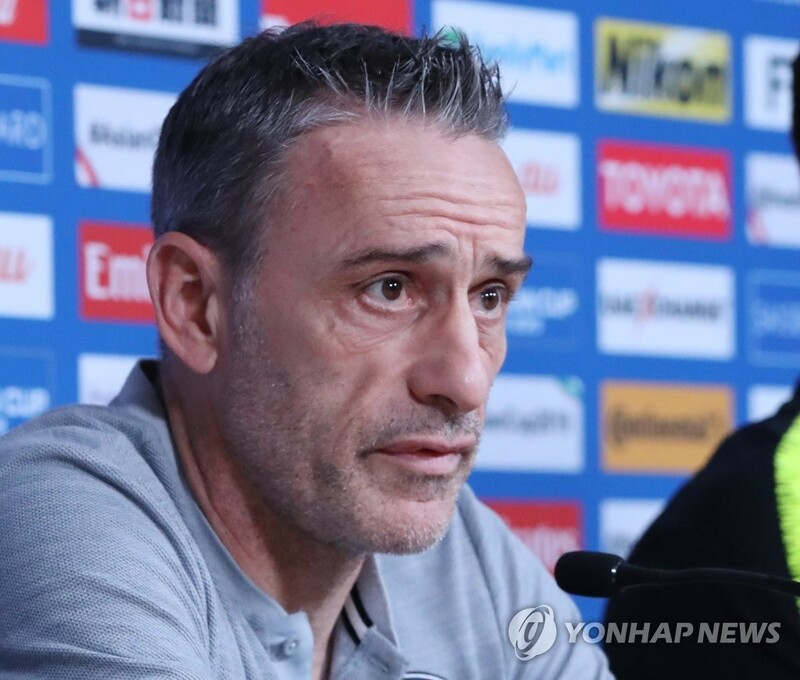 South Korea coach Paulo Bento said Tuesday he hasn’t decided whether to play Son Heung-min in a key group match at the ongoing Asian Football Confederation (AFC) Asian Cup. South Korea will take on China on Wednesday with the top seed in Group C on the line. The kickoff, at Al Nahyan Stadium in Abu Dhabi, is 5:30 p.m. local time, and 10:30 p.m. in Seoul. Both teams have won their first two matches to secure knockout-round spots, but China are in first place thanks to their superior goal difference — plus-4 to plus-2. Son, who has been red hot for Tottenham Hotspur in the Premier League over the past month or so, joined the national team on Monday, just when Bento’s squad, limited to a single goal in games against underdogs Philippines and Kyrgyzstan, needed some offensive spark. But with the major reinforcement on hand, Bento said he wants to take things carefully. Son, who was nominated for Premier League’s Player of the Month honors for December after putting up six goals and three assists, is easily the most talented offensive player on Bento’s team. The coach said Son is “an important player for our team,” but South Korea still have enough depth up front. South Korea, seeking their first Asian Cup title since 1960, played their first two contests without Son because of an agreement between the Spurs and the national team. The Premier League club held him out for the first two group matches here, after allowing him to play at the Asian Games last summer. The Group C winners will have an easier path through the knockout bracket, both in terms of potential opponents and travel. The top seed will also have extra rest before the tournament phase begins. The Group C winners will play their round of 16 match next Tuesday, but the runners-up will face Thailand, the Group A runners-up, on Sunday. South Korea have dominated the head-to-head meetings, to the tune of 18 wins, 13 draws and two losses. But the Taeguk Warriors are winless in the past two matches against China — with a 1-0 loss in the World Cup qualifying campaign in March 2017 and a 2-2 draw at the East Asian Football Federation (EAFF) E-1 Championship in December 2017. China, coached by World Cup champion Marcello Lippi only need a draw Wednesday to take the top seed but South Korea must win the showdown to finish atop Group C.
Earlier in the day, Lippi said in his press conference that midfielder Wu Lei will miss Wednesday’s match with a collarbone injury. Wu, who grabbed a brace in a 3-0 win over the Philippines, will be ready to play in the knockout round, Lippi added. Bento said he doesn’t pay too much attention to the opposing team’s lineup situations because he has to worry about his own team. Two key midfielders, Ki Sung-yueng and Lee Jae-sung, missed the previous match with injuries and are doubtful for Wednesday. Starting right fullback Lee Yong has been suspended after receiving a yellow card in each of the first two matches.